Looks like those Beast Masters who didn't want to have a Skoll lookalike following them everywhere can rest easy now. Thank you for this Blizz! Now I can finally bring forth my massive army of ridiculously oversized devilsaurs! Disclaimer: use of huge pet army not recommended in instances or raiding. YEEEEEEEEESSSSSSSSS! I am so happy! This is probably my number one request for hunters in Legion, dual pets! I know Hati was already sort of a dual pet, especially now that BW and KC will affect her, but being able to transmogrify her to be like any of your other pets is just icing on the cake! Especially since you will be able to use ANY pet you want without having to worry about the buffs they bring! thank you blizzard, didn't think they'd listen to this from all thing but hey! Question now is.... Where is this found and what do I have to give to get it? Does as the tooltip says; changes Hati (companion wolf from Titanstrike artifact) to look like your current pet. This is pretty good as you can now customize a bit more and not be just another hunter with a Hati next to you. I personally like to have mine as a green core hound, but each to their own! Enjoy! Now, the big question is, How do I return Hati to his original look? I leveled my hunter to 110 three days into the beta. BM spec and no Essence Swapper quest. Can't find quest giver. Suggestions? will appear at a holopad to the right of your Scouting Table, beside the weekly Mythic+ chest and will only appear if approached in Beast Mastery Specialization. Can you also change Hati's name though? That would make me even happier. I get that there is lore and reason behind it but I would honestly just prefer to have a second pet entirely of my choosing or preference. Does anyone know of a way to revert Hati to the original look? Once Hati has been given a new look she still retains the visual lightning effect which is pretty cool. Thankfully the constant electricity crackling sound is gone which is the main reason I wanted to get this item. In case you somehow manage to lose your Essence Swapper, you can go back to Mimiron's image and ask him for another one. Edit: This was hotfixed Sept 13th and no longer works. Hati reverts to his original skin if you try it. If you have the swapper and want to get the Demon skin that looks like the old Warlock metamorphosis then you need to do the following (before they hot fix it). 3. Make sure you have your pet out and go inside the cave. 4. Kill the mobs in there by standing very close to them. You will get a poison buff. 5. After a couple kills your pet will turn into the Demon. 6. Use Essence Swapper. Win. Some notes about the Essence Swapper. 1. You can use it multiple times. There is no limit. 2. If you lose it, just go back to Mimiron's Image and get a new one. 3. Once you use it you can not currently get the original Hati skin back (as far as I know of). Essence Swapper can be used multiple times.... is not a one shot thing...so don't worry to much deciding. Still no word of if we can change Haiti back to normal. However, you might hop over to Stormheim and tame Bloodstalker Alpha. The lightning effect Haiti comes with covers up some of the lost effects, so it should be passable until we get a fix. This is super fun to play around with. Like the Demon-skin mentioned below. Go into a duel with a mage and let it polymorph your main pet into one of the different polymorph critters available, while you channel the Essence Swapper and youll have a permanent critter pet. The pig is super cute when it fights and is perfect for that "farmer look". Might want to go for the rare "baby" turtle if you want to stand out tho. By using a discombobulator Ray, I have now my own Leper gnome pet who obeys his gnome masters every command. Please, for the love of god, don't change this item because it's fun! You CAN NOT change hati back to its original form after use. This has been in beta forums for a while now. Blizz never fixed. If enough of us tweet/complain then maybe they will fix this. When Hati is transformed, it causes him to have *all* the sound effects of the pet that you would normally have. This means that things like roaring devilsaurs, heavy turtle footfalls, flapping bird/bat wings, slobber-roaring cats, snarling and arguing hydra heads, and of course howling wolves will be duplicated as well. Be prepared for that, if you transform him into a pet that has ambient noises. It can become quite noisy! I saw someone with Hati changed into a Murloc. HOW? Does anyone know? When used on the teroclaw pets (such as Kil'uun) Hati will grow to TWICE your character's size. I'm not sure if this is a tauren scaling issue or the pet itself but it's certianly a sight to see! For those looking to use this to get the baby murloc...wish for luck and hold onto patience. The murloc you are looking for is in Howling Ford //Chillmere Oracle/chillmere-oracle#abilities . You want the oracles. I had my pet go stand on one, then slowly kite it to the next cluster...grab one there and then went to one more cluster. Killed the ones that weren't oracles there and ended up getting two more that spawned. I had 4 by then end all beating on my pet. After that, I just kept spamming the essence swapper. Since your pet is so high in level, they miss a lot and it can be a little time consuming and a lot of it is just pure luck on getting it at the same time they change your pet into a murloc . If he turns way before your timer on the swapper is up, they will aggro on you-no worries, just FD and they will go back to your pet. Also stand back a bit, as every so often they will ice you and that will interrupt the spell. Took me about a half hour, maybe a tad more....so not all that bad. I suspect Blizz will either nerf this or just let it run it's course, since Hati is connected to your gun? Until whichever, enjoy...he's worth the effort. lol Good luck! PS BEEN HOTFIXED...my cute little murloc was gone today and I'm assuming it is the same with all the other unique skins people have found. Just wanted to make sure to note this, so no one wastes their time on it. For those of you trying to change it to a demon, undead, or skulking hulk. Its been hotfixed for atleast the demon. I havent been able to test the others. I changed my Hati back to its original look accidentally. My original purpose was to achieve that favorite demon form on Hati. - First go to the cave near the harbor outside the Orgrimmar. - Attack humanoid mobs in there to stack 5 of poisons. - Your pet will look like a demon form. - Use Essence Swapper and make Hati look like that demon. But when I relog my character next day my Hati was back to its original look. I hope it works for you guys who want to change it back to its original look. Had something odd happen today. There have been 1some reports of players having thier Hati skin reset back to its original form after the latest patch. This mainly happens if thier skin was changed to a non-beast swap such as the Meta-Locks and pre-cata worgen models. Mine personally was the Troll berserker model that could be used from Sunken Temple, which also reset after a feign death randomly. I went to re-swap back to the model I used, only to find that my pet becomes an invalid target once it is changed, but if you cast the swap before your pets model changes to the model you want it still works and the swap will change your Hati to whatever you wanted. I had used the swapper for a couple of days and most recently to a quillen. When I logged on this afternoon Hati was back to his original look. That is cool with me. I can use it and it resets. You can no longer use this item to transform your Hati into a polymorphed skin, such as demon form, murloc, undead, etc. If you do, it will automatically transform back into a wolf form. Thank you Blizzard for once again taking away the fun. Hati will now reset appearance to the default blue wolf form the first time summoned. Developers’ Notes: Due to a bug, some hunters had Hati transform with the Essence Swapper into appearances that are unintended. A fix has been made for this to prevent future issues, but to get rid of any unintended appearances that players may already have, Hati’s appearance will be reverted to the default blue wolf when first summoned, and should retain any appearance changes thereafter. The Essence Swapper will continue to allow you to change Hati’s appearance to match that of your currently active hunter pet. Beware! Read that they fixed hati and decided to give the essence swapper a try. I was under the impression with the hotfix that the first time you summon hati after you log in, or equip your artifact she will be normal, thus reseting her. Oh how wrong I was. Nothing I do resets hati back to normal. Super bummed. If anyone was wondering, this item copies pet transparencies as well. If you use the swapper on a pet like disembodied jormungar or snort, Hati will become transparent to match them. Electricity effects remain unchanged, however. If used on a crab pet, for example, you will not be able to use Crab Shank on Hati. He will not count as a crab and I now regret using the swapper on him. Found a way to currently turn Hati back to normal. Find someone to go along with you, you're going to need someone as a trigger-man essentially. Go to the cave in Durotan by the docks that have the Orcs with the demon blood. Stand far, away, and have your pets both stand on top of an orc on passive. Once they are standing, have your trigger-man attack and kill the orc. The pets will get a stack of the demon blood. Repeat this three more times for four stacks. On the fifth stack, have the trigger-man pause before they kill the fifth orc. Start your cast with the Essence Swapper, and when it's about halfway done, have the trigger-man kill the orc. On the fifth death, your pet and Hati will both attempt to turn into Demons. However, with the hotfix Hati can no longer do this. Hati will turn back into the blue wolf. I've hearthed (which is what turned Hati back into the previous pet before), and Hati was still the crackling blue wolf. Considering I had him turned into a polymorphed creature prior to this attempt, I think that the old skin has stuck. You know I think they could have an easy fix for this. 3 easy fixes. - Why not change the essence swapper to a buff you know a on and off feature. when its turned on it copies the skin of whatever pet you had out at the time You used it and then when you use it again instead of doing the same thing it turns off the skin so you have to use it a 3rd time to reapply the new skin. - Or make it so that Thorim always has Hati beside him as I am sure he does and if you fly over there click on hati and Use the essence swapper it will copy the skin. But only on Hati will it work like that. Comment away guys if Blizz see this maybe this will give them their answer. Then I found a solutoin! How do i get the troll berserker look? is it still possible? You can turn Hati into a Saurok too. Go to the Isle of Thunder, into Ihgaluk Crag... exactly, the area where you got turned into a saurok, and your pet into either a mini saurok or a blob, a roach, among other things. Just keep attacking the sauroks in the area to reset the transformation on your pet, or just make him use any non-attacking ability (like Surface Trot), that he'll turn to his normal form, while he is not turned into any of the above IMMEDIATELY USE THE ITEM ON HIM, while channelling, watch if he turned into a saurok, if not you may cancel the channel and repeat with either sending him to attack or reuse any ability... rinse. This strat may work with the demon too. Blizz should allow us to use that one, since the pet doesn't turn into a damn big demon, eitherway, you can use the diminish pet glyph, as I did, and still got a not so big demon Hati around. This is how I changed Hati back to Hati. I went to the cave next to Orgimmar. Killed orcs til I got 5 stacks of the debuff that made Hati & my mana saber into demons. After the debuff wears off, Hati takes it's original form. Easy. As a side note, I leveled as survival. When I hit 110 and went back to Trueshot the quest did not automatically pop up. I had to speak with the image and then the quest was given. Seems like Hati is bugged if you use this to swap her model to boss models like Thok or Chimaeron. I don't know what causes this though. I wanted to use Chimaeron's model and I just got this giant boss roaming dalaran. I reported it to blizz in hopes they fix this. Hey, y'all. If your Hati's too big, there's a current work around. It's not ideal, but, it works. 1) Head shy south of Orgrimmar to Dustwind Cave. - Directly bellow Drygultch Revine. 2) Have Hati and your main pet manually attack the local Orc NPC's. 3) With each kill, allow Hati to stack up 'Fel Blood' to 5, turning into a Demon. 4) Allow Hati's Demon form to roll off, reverting her form. Currently on 7.1 PTR Live Image of Mimiron has a new dialogue option that allows to return Hati to his default look. I found out about the 'super size' Hati glitch about a day before the fixed it. During that brief time i made a humorous video taking advantage of ThokZilla. While the essence swap bug of 7.0.3 is well gone the idea of differing sizes of hati essence swaps came to mind while I was staring at my Thok swap and wondering why it was slightly larger than normal devilsaurs. 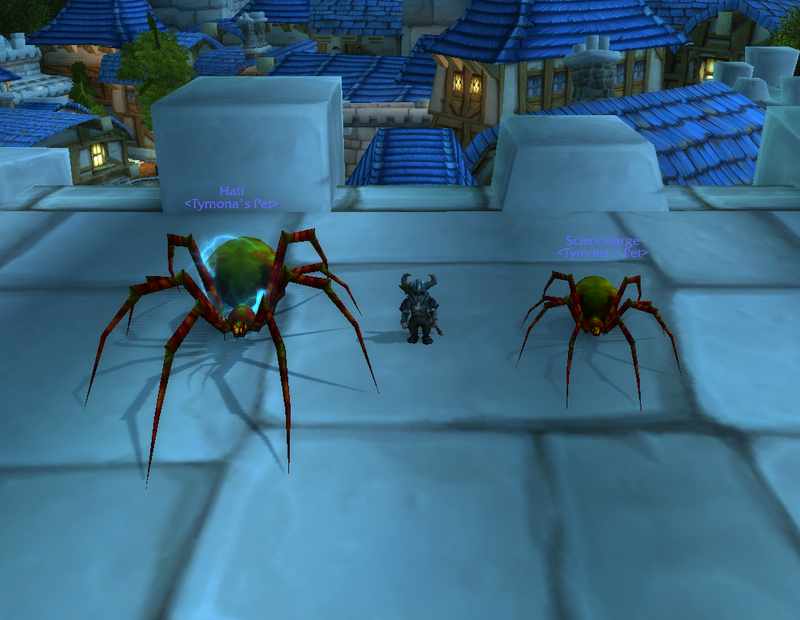 So I ran some tests with a pair of wonderful spiders who share the same model and color but vary greatly in size, Terokkarantula and Mother Fang. To the surprise of either everyone or no one the size varies greatly. So for those looking for some larger or smaller versions of hati with a specific skin, keep in mind the scale of the beast you first tame. Creatures who are just generally large like devilsaurs may have a smaller variance from one to the next. It would seem after some additional testing with some core hounds, crabs, raptors and twitchy silithids that the original post is not actually the case and Thok and Tero simply have some sort of "I am become larger" stat for Hati. I may continue on to make a list of differently sized essence swaps as it seems there are certain cases they are differing size. A cool thing that should stay around, not sure if its intentional but its in the game. Mimiron, at your Order Hall, can now change Hati's appearence back to her original form. Okay blizz, too big pets, what about warlock's Doomlord? 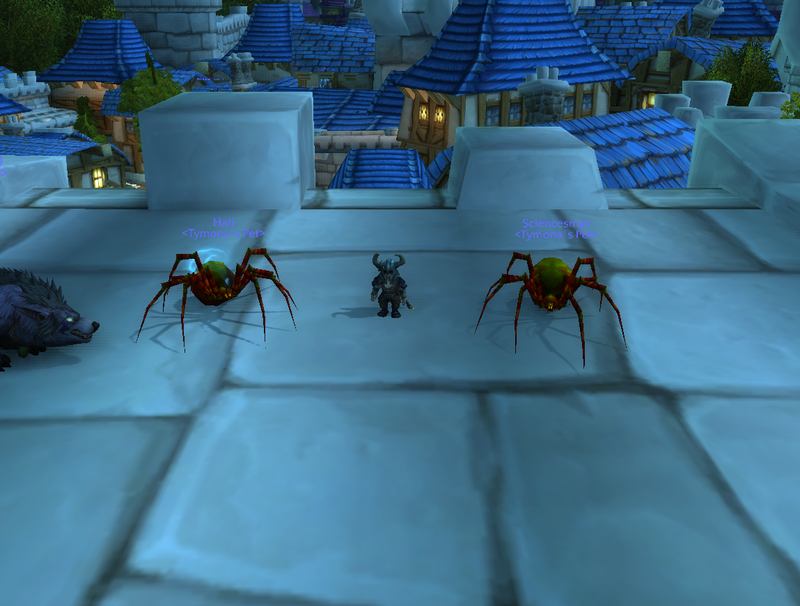 Since 7.1 they are way bigger than I remember. And what about UDK's Abomination pet? Too big too. Both pets bigger than most big mounts in the game. How often can you change Hati's appearance? or is it a one shot deal? For those who want to return Hati to his original look. He uses the same model as the wolves located in Vale of Eternal Blossoms (MoP), tame one of them, swop essence and Hati is his old self again. Just in case, because I know I'VE been running around and even made a GM request ; to make the image of Mimiron appear, you have to be in Beast Master spec, even if you already have the quest. I leveled up my hunter in beast master so when I dinged 110 I took the quest, then respecced Marksmanship for dungeons and raids. The next day I did the quest (that was 3 days ago), and just turned it in because I just realized I had to be in the correct spec. Am I the only person who wishes this would also work the other way around? I wouldn't mind having two Hati skinned wolves. ok, looked at a lot of comments until my eyes were fuzzy. One thing I didn't see was...If you want to make your pet look like Hati can it be done? Does anyone have any pets that currently do not resize correctly. My thok is still way to big when in hati form and from time to time grows so big all I can see is his foot. Is anyone else having these issues with pets? If you delete this item you can restore it by talking to Image of Mimiron inside the Hunter class hall. In order to see him you have to stand right next to his image transporter so that he knows you are trying to summon him. The larger size on some pets (like Thok, which looks great with Hati's lightning) get quite large. I'm sure my guild's tank will just love this. I'm so disappointed that the grow/shrink bug hasn't been fixed. I lucked out with my troll hunter, and her tigers are fine, but my worgen's ravens are all wrong. Is the problem completely random, or does it affect specific pet models? If the latter, has anyone gathered a list of models that actually work? The drop rate must be extremely low, as I've cleared out the Seabound Mystic area quite a few times now and have yet to drop the quest item. I propose that those of us who loved having Hati around politely suggest that Blizzard make this now defunct Essence Swapper switch the appearance of the pet summoned with the talent Animal Companion INTO Hati. Mimiron could return to our Class Hall to let us switch the appearance BACK into the default skin. With this option it might be even possible to have TWO Hati running around if you use the Swapper on that pet, stick it in your active Slots and then Swap the new First slot to a Hati appearance! This would be a dream come true for many hunters! Edit (Patch 8.1.5): HATI IS NOW ONCE AGAIN AVAILABLE! The Essence Swapper DOES NOT work on the new Hati. When Hati is in the Animal Companion slot, there is no change in appearance if the item is used (also no effect if any other beast is in the same slot), so no changing Hati to look like your other pet. Here's hoping this will change in the future! However, you CAN now tame MULTIPLE Hatis and run around with two! If you're wondering if you can have any skin/color Spirit Beast you want because you still have your Essence Swapper... the answer is no. I spec'd into Animal Companion and tried it with Hati as my active pet and Hati as the pet in the first slot of my stable. Neither worked. Use: Channel the Essence Swapper at your pet for 10 sec, at which point Hati's atomic structure will instantly change to match your pet's.